The discovery of the okapi shocked the world in 1901. African explorer, Henry Stanley, called it “donkey-like,” while others thought it a new species of zebra, given the stripes. However, this notoriously-secretive rainforest ungulate proved to be the world’s only living relative of the giraffe, making it one of most incredible taxonomic discoveries of the Twentieth Century as well as one of the last large-bodied mammals to be uncovered by scientists. 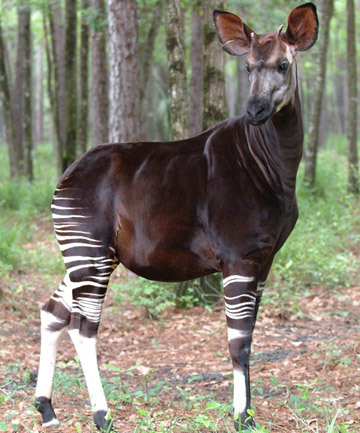 But the future of the okapi (Okapia johnstoni) is increasingly in doubt: a new update of the IUCN Red List released today has raised the threatened level for the okapi from Vulnerable to Endangered. Found only in the Ituri Rainforest in the Democratic Republic of Congo (DRC), the okapi has been hit hard by deforestation, poaching for skins and bushmeat, bycatch in snaring, and, most importantly, roving bands of poachers and rebells. Nothing typifies the perilous situation of the okapi more than the attack last year on the headquarters of the Okapi Wildlife Reserve in Epulu. MaiMai rebels, led by an infamous poacher known simply as Morgan, launched a sneak attach on the station, killing six people and shooting dead 14 captive okapis that were meant as ambassadors of the species to the local community. Reportedly, the poachers were striking back for increased enforcement against wildlife poaching and illegal mining in the reserve. Okapi. Photo by: Bob Jenkins. In fact, the new assessment found that the okapi population with the Okapi Wildlife Reserve had dropped by 43 percent from 1993 to 2007. “[The Okapi Wildlife Reserve] was until recently the most effectively protected okapi site with resident rangers and an active conservation program and the overall rate of decline here is inferred to have been equalled or exceeded elsewhere,” the assessors write. Conservationists fear that the species’ population has been cut in half since 1995 across its range. The poachers who attacked the headquarters in Epulu remain at large. (09/09/2013) On June 24th of last year, MaiMai Simba rebels, led by an elephant poacher known as Morgan, launched a devastating attack on the headquarters of the Okapi Wildlife Reserve in Epulu, Democratic Republic of Congo (DRC). The attack, which was reportedly in response to a crack down on poaching and illegal mining in the park, left buildings burned, equipment destroyed, and six people dead including two rangers. The militia also left with 28 women hostages, many of them minors. As if to add insult to injury, the militia didn’t leave until they shot dead all 14 captive okapis at the headquarters, which were used as wildlife ambassadors for the local community. (06/05/2013) The Lord’s Resistance Army (LRA) is using lucrative elephant poaching for ivory to fund its activities, according to a report published on Tuesday. Eyewitness accounts from park rangers, Lord’s Resistance Army (LRA) escapees and recent senior defectors report that the fugitive warlord Joseph Kony, who is wanted by the international criminal court for war crimes and crimes against humanity, ordered African forest elephants to be killed in Garamba national park in the Democratic Republic of Congo (DRC) and the tusks sent to him. (05/21/2013) The Forest Stewardship Council (FSC), a body that certifies forest management practices, has revoked all certificates granted to the Danzer Group, a multinational logging company, over alleged human rights abuses by one of its former subsidiaries in the Democratic Republic of Congo (DRC), reports Bloomberg. (04/03/2013) Early on a Sunday morning last summer, the villagers of Epulu awoke to the sounds of shots and screaming. In the eastern reaches of the Democratic Republic of the Congo, that can often mean another round of violence and ethnic murder is under way. In this case, however, something even more horrific was afoot. (03/11/2013) Elephants are vanishing. The booming illegal ivory trade is decimating the world’s largest land animal, but no place has been harder hit than the Congo basin and its forest elephants (Loxodonta cyclotis). The numbers are staggering: a single park in Gabon, Minkebe National Park, has seen 11,100 forest elephants killed in the last eight years; Okapi Faunal Reserve in the Democratic Republic of the Congo has lost 75 percent of its elephants in fifteen years; and a new study in PLoS ONE estimates that in total 60 percent of the world’s forest elephants have been killed in the last decade alone. But what does that mean for the Congo forest? (03/04/2013) Yesterday, the EU joined the U.S. and Australia in banning all timber that was illegally harvested abroad. The new regulation could have a major impact on where the EU sources its timber, and no where more so than the Democratic Republic of Congo (DRC). According to a new report by Greenpeace, the DRC’s current moratorium on industrial logging is being systematically circumvented making all timber from the country suspect. (02/28/2013) A key Congo wildlife reserve has lost 75 percent of its elephants in just 15 years due to poaching to meet Asian demand for ivory, reports a new survey by the Wildlife Conservation Society (WCS) and Democratic Republic of Congo authorities. (02/25/2013) Last year, Roger Peet, an American artist, traveled to the Democratic Republic of Congo (DRC) to visit one of the world’s most remote and wild forests. 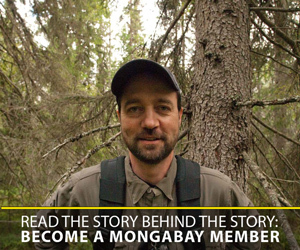 Peet spent three months in a region that is largely unknown to the outside world, but where a group of conservationists, headed by Terese and John Hart, are working diligently to create a new national park, known as Lomami. Here, the printmaker met a local warlord, discovered a downed plane, and designed a tomb for a wildlife ranger killed by disease, in addition to seeing some of the region’s astounding wildlife. Notably, the burgeoning Lomami National Park is home to the world’s newest monkey species, only announced by scientists last September. (02/11/2013) Two environmental activist groups blasted the World Bank over its reported decision to block a probe into its support of industrial-scale rainforest logging.